Denny Emerson, eventer, trainer, coach, author, leader, activist, has been a significant, influential force in the equestrian community for a half-century. 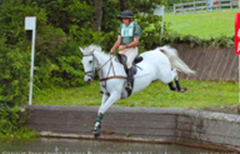 Denny has forged a career with horses which culminated in his receiving the both the United States Eventing Associations (USEA) Wofford Cup for lifetime service to eventing, the American Riding Instructor Certification Program (ARICP) Lifetime Achievement Award, induction in 2006 into the USEA Hall of Fame. Now in his 48th consecutive year of competing at the preliminary level or higher, Denny has achieved much success in the sport of eventing. In 1974 Denny rode a clean cross country round at the Burghley, England World Championship Three Day Event, to secure a team gold medal for the United States Equestrian Team (USET) and in 1976 Denny was the reserve rider for the USET at the Montreal Olympics. In addition to his eventing career, Denny has been involved in numerous other horse sports during his 56 years of competing. He rode in his first one-hundred-mile trail ride in 1956. Forty-eight years later, in 2004, Denny won a Tevis Cup buckle in endurance, for completing the 50th Anniversary of the Western States Trail Ride, the most famous and arduous hundred-mile endurance race in the world. Denny is also a respected writer, authoring regular columns for The Chronicle of the Horse since the inception of that forum about fourteen years ago. He has been featured three times on the cover of Practical Horseman magazine in conjunction with feature articles which he authored in 1982, 1991 and 1999. Denny wrote the forewords to Sally Swift’s huge best selling book Centered Riding, to Priscilla Endicott’s Taking Up the Reins, to Donna Snyder-Smith’s The All Around Horse and Rider, and to the USCTA Book of Eventing. Denny is a 1963 graduate of Dartmouth College. He and his wife May have two grown sons, Rett and Jamie. They divide their time between Strafford, VT and Southern Pines, NC.